TFNation have announced their latest guest for TFNation 2019. 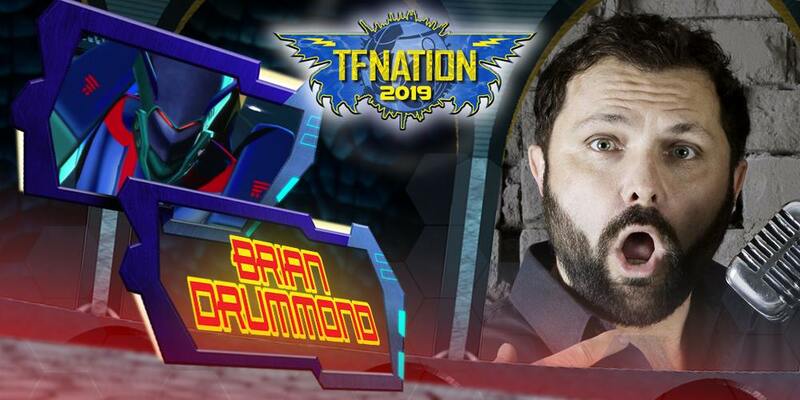 Joining the TFNation 2019 guest lineup is voice actor Brian Drummond! Brian Drummond’s voice talents have been pleasing the ears of fans for many years now. He was a part of the cast of Beast Machines as the deliciously evil Jetstorm – and he also went on to voice several characters in the Unicron Trilogy of shows, including Blurr in Transformers Armada, Shockblast aka Shockwave in Transformers Energon, and the Australian accented Jetfire of Transformers Cybertron as well as Jolt, the only Mini-con with a regular speaking role in the whole trilogy. He’s also voiced several other characters, including the Princes of all Saiyins himself, Vegeta of Dragonball Z, and several characters in many other anime dubs and in the Lego franchise. TFNation 2018 will be taking place over the weekend of 16 – 18 August 2019 at the Hilton Birmingham Metropole in Birmingham in England. Brian Drummond will be joined by voice actors Gregg Berger (Generation 1 Grimlock, Jetfire, Long Haul and more), Peter Spellos (Robots in Disguise Sky-Byte), Beast Machines and Transformers Animated story editor Marty Isenberg, writers Simon Furman and James Roberts, writer and artist Nick Roche, artists Jack Lawrence and Kei Zama and colorist John-Paul Bove. Panels will include a special look at rare, unreleased and never-before-seen Transformers merchandise. Check out the TFNation homepage for more information and to pre-register. I'm hoping to make it to TFNation this year. It'll be my first time, and it'll be my first time cosplaying from Transformers. I generally don't bother since none of them are in my country, but that's equally odd to me, you'd think you would go for people currently working on it over people who used to but no longer do. That’s not even what any conventions do. They’re celebrations of transformers. They invite a lot of people to be guests and share their experiences and stories about their time working on transformers. Have you not seen any guest lists for these cons? It’s not just about thwtas currently going on. It’s guests who have working with transformers. Bob Budiansky is going. He hasn’t worked on anything Transformers since 2006 and before that? Almost 20 years. What is this? Lore I have not kept??? Someone explain before my head explodes! Not even really, it’s completely unofficial. Tfwiki does not catalogue anything unofficially related to transformers. No 3rd party toys or groups and no cons that are no part of Hasbro. It’s been a rule since day one. I gotta say I do find it amusing that Roberts is there despite not writing tf anymore and seemingly not being that interested in writing it again. I'm not mad at him or throwing shade or snark or anything, I just genuinely find it funny. Have you not seen any guest lists for these cons? It’s not just about whys currently going on. It’s guests who have working with transformers. Bob Budiansky is going. He hasn’t worked on anything Transformers since 2006 and before that? Almost 20 years. I find it strange that TFwiki has almost nothing on TFNation. Especially with that animated "finale" comic. It warrants more mention. Each Botcon year got its own page, but TFNation doesn't even have its own article. Is this some kinda bias or is it not as "official" somehow? Nice, also love his work as Matau and Onewa. In his first Transformers convention appearance on our shores, TFNation is proud to announce another voice actor for 2019: Brian Drummond, voice of Transformers Beast Machines Jetstorm! One of the major players in the series, Jetstorm is but one of the many characters that Drummond has lent his talents to, for our robot friends' age-spanning media franchise. His credits list features the likes of Armada Blurr, Energon Shockblast, and Cybertron Jetfire and Jolt, starring in the entire Unicron trilogy. Outside of Transformers media, he is most famous for anime dubs such as: Dragon Ball Z (as the Saiyan prince Vegeta); Death Note (death god Ryuk), several Mobile Suit Gundam series characters; Black Lagoon (as Benny); and many others beyond. In Western animation, his voice can be found in several Lego media franchises like Bionicle, Ninjago, Nexo Nights and Star Wars; alongside Barbie, Bratz, My Little Pony, Hot Wheels, Littlest Pet Shop, and The Little Prince, to name a few. Brian Drummond will be attending the convention all weekend, talking about his work in the voice acting industry, making pop-culture references (in and out of character), and chatting to fans. We look forward to welcoming him and all of you to TFNation 2019. Stay tuned for more updates! If you want to ensure you receive all announcements, join our mailing list at https://tfnation.com. Nick Roche shared at last year's TFNation he'd been working on a series that was intended to be short stories – generally a 12-15 page story with a 6-8 page backup strip. The idea was to tell stories from all eras of Transformers – with the shorter strips used as a way to get different creators to do some Transformers stories. It sounded like an extremely cool idea the way he explained it and I'm really disappointed it never came about due to the end of IDW's current Transformers continuity. Wow, this had so much potential! If these stories really were supposed to be from different iterations of the franchise, maybe there's hope something similar could still happen! How about Animated season 4 being told in comic form? Or some Beast Era stuff? There are so many possibilities. Marty is super nice, he gets a pass for BM. TF Animated needs a come back. MARTY ISENBERG TOO?!? Oh my god. If only he and Derrick were there to announce a revival of Animated on the ten year anniversary. Still amazing!! Marty Isenberg will be at TFNation 2019!